Winter is by far the coldest season on the year. It is also the season of the weakest solar radiation from the sun with the occurrence of both shorter days and longer nights. Interestingly, the winter season occurs during the months of December through March in the Northern Hemisphere and from June through September in the Southern Hemisphere. Hence, as we’re experiencing icy and chilly conditions in most parts of the nation with temperatures in 20’s and 30’s in the Northeast, Midwest and Northwest, the climate in South American countries such as Brazil, Argentina and Peru is in the upper 70’s and 80’s. You do not have to travel to South America or other warm venues this season to discover the hot, new watch fashions you’ll find featured in the Winter Time Classics Event taking place at The Watchery this week. Over 170 popular men’s and women’s watches are featured in the promotion from today’s top watchmakers, including Rolex, TAG Heuer, Breitling, Alpina, Invicta, Michael Kors, Baume & Mercier, TechnoMarine, Swiss Legend, Eterna, Lucien Piccard, Gucci, Bulova, Seiko, Tissot and Citizen. The TAG Heuer Carrera Automatic men’s timepiece is an extraordinary selection. This precision-crafted Swiss-made timepiece reflects a rich heritage of time-keeping excellence with a 26-jewel Calibre 5 automatic movement inside and a 38-hour power reserve, too. The classic contoured round case in premium grade stainless steel is polished to a mirror-bright glow. An exhibition skeleton case back lets you see the automatic movement inside. The attractive brown alligator strap has a deployment clasp for added convenience. The silvery-white dial shines with a day and date window at the 3 o’clock hour, luminous rose gold-tone hands and hour markers. An exhibition skeleton case back lets you see the intricate movement inside. 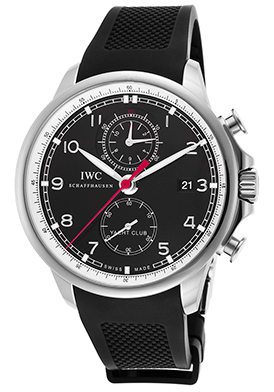 Features include a scratch-resistant sapphire crystal above the dial and water-resistance to 100 meters or 330 feet. 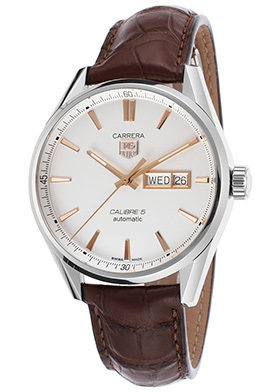 The TAG Heuer Carrera Automatic men’s watch is 41mm in diameter and 13mm thick. The Hamptons off of Long Island in New York is a popular summertime destination and the Baume & Mercier Hamptons watch for women captures the glowing spirit of the seaside resort. The signature rectangular shaped case in polished premium grade stainless steel is presented on the attractive horizontal link bracelet in brushed and polished premium grade stainless steel. The attractive white dial with a silvery-white outer dial shines with rose gold-tone sword hands and raised rose gold-tone Arabic numeral hour markers. A window at the 3 o’clock hour reveals the automatic date calendar. Premium Swiss-made quartz movement inside assures you of precise time-keeping accuracy. Features include a scratch resistant sapphire crystal above the dial and water-resistance to 50 meters or 165 feet. 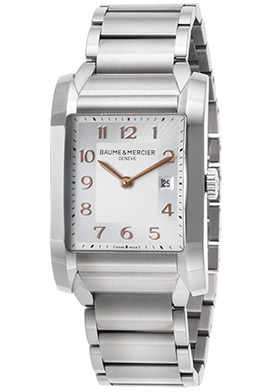 The Baume & Mercier Hamptons women’s watch is 27mm wide and 7mm thick. 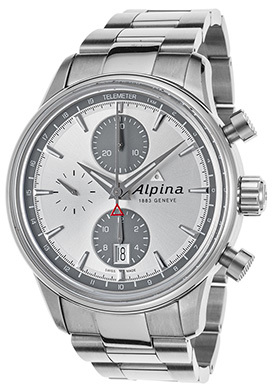 Snow skiing is a popular winter sport and there is no better way to escape to the Swiss Alps than with the Alpina Alpiner Automatic Chronograph for men. 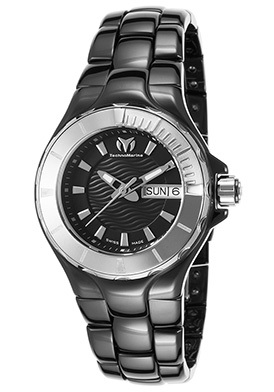 This sleek and sporty men’s watch features the 42mm diameter, 14mm thick case in brushed premium grade stainless steel, presented on an attractive triple-link bracelet in brushed and polished stainless steel. The integrated stationary bezel surrounds the silver-colored sunray dial with a telemeter outer dial, small-second, 30-minute and 12-hour sub-dials, an automatic date window, luminous silver-colored hands and hour markers. Features include a 46-hour power reserve, along with a scratch resistant sapphire crystal above the dial and water-resistance to 50 meters or 165 feet. You’re certain to be in a vacation state-of-mind with the TechnoMarine Diamond Cruise Chronograph for women wherever you go this winter. This exquisite women’s watch glistens in white ceramic, rose-gold tone stainless steel and diamonds. The generously appointed case in lustrous white high-tech ceramic is presented on a supple white silicone strap. Thirty-eight shimmering round-cut diamonds create a dramatic focal point on the upper quarter of the unidirectional rotating bezel in lustrous rose gold-tone stainless steel with white ceramic accents. The multi-layered white dial shines with a wave-patterned center background, three sub-dials, luminous sword hands and ten glistening diamond hour markers. Features include an automatic date window, 1/10th of a second, small-second and 30-minute countdown timers. Additional features include quality Swiss-made quartz movement inside, a scratch resistant sapphire crystal above the dial and water-resistance to 200 meters or 660 feet. 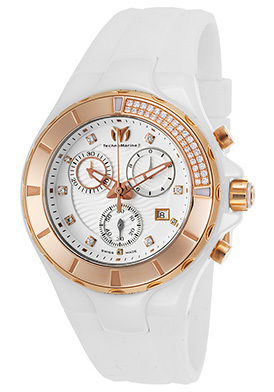 The TechnoMarine Diamond Cruise women’s chronograph is 40mm in diameter and 14mm thick. 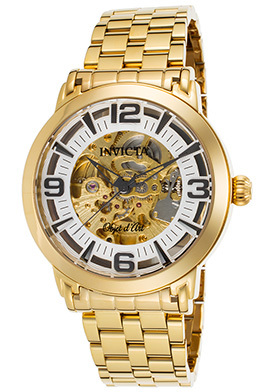 The Invicta Objet d’Art Automatic men’s watch is certain to warm up your wrist this winter. This transitional men’s watch offers the best of both worlds with timeless traditional elegance matched to modern, contemporary aesthetics. The contoured 44mm diameter, 13mm thick case in polished 18K yellow gold-plate is presented on a handsome vertical link bracelet in brushed and polished yellow gold plate. The semi-skeleton center dial is accented by a white outer dial, black sword hands, Arabic numeral and baton hour markers. The onion shaped crown with decorative fluted detail adds distinction. An exhibition skeleton case back lets you see the intricate movement inside. 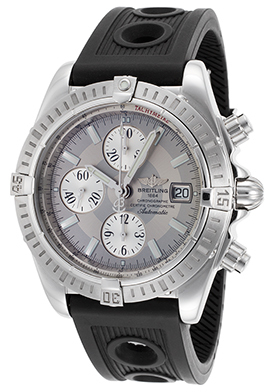 Features include a scratch resistant Flame Fusion crystal above the dial and water-resistance to 50 meters or 165 feet. 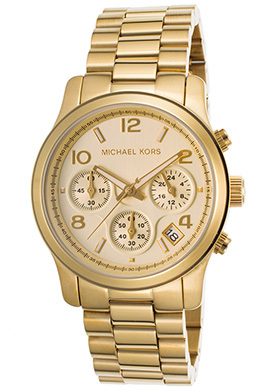 The Michael Kors Runway Chronograph for women is an ideal winter selection in yellow gold-tone stainless steel. The generously oversized case in polished yellow gold-tone stainless steel is presented on the attractive triple-link bracelet in brushed and polished yellow gold-tone stainless steel with a push-button clasp for added convenience. The stationary bezel surrounds the champagne colored dial with small-second, 60-minute and 24-hour sub-dials, an automatic date calendar, luminous hands, luminous baton and Arabic numeral hour markers. 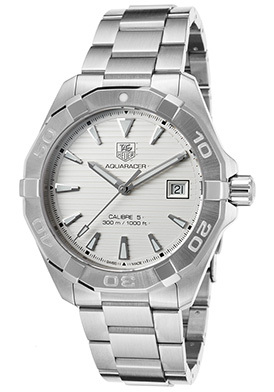 Features include quality quartz movement inside and water-resistance to 100 meters or 330 feet. The Michael Kors Runway women’s chronograph is 38mm in diameter and 13mm thick. Winter in Switzerland image courtesy of Wiki Commons. 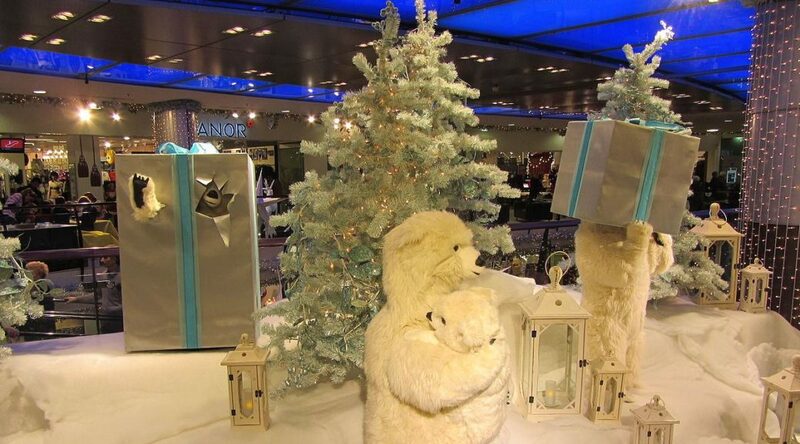 The festive holiday season is at its peak this week with New Year’s Eve just a few days away. 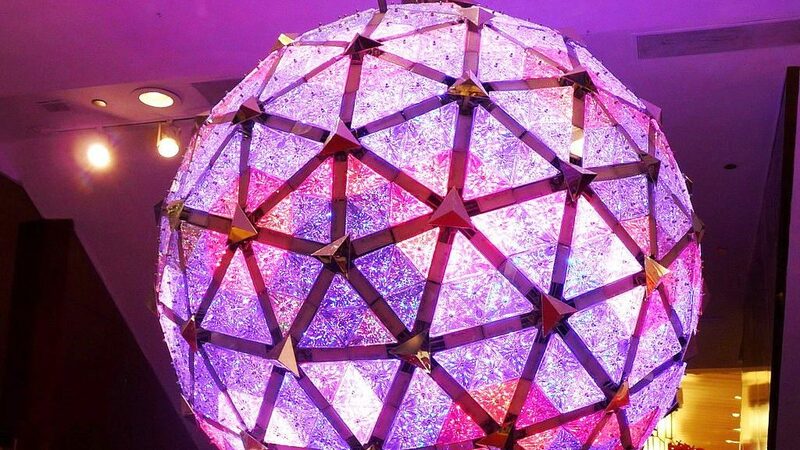 Global celebrations are about to take place throughout the globe from the fireworks at Sydney Harbour in Australia, the lighted illumination of the Eifel Tower in Paris, France along with the dropping of the ball in Times Square, New York. We’re celebrating the arrival of the New Year at The Watchery with Luxury Time Favorites for 2017. Over 270 high-end timepieces for men and women are featured in the promotion, including popular styles from Rolex, Eterna, Maurice Lacroix, Alpina, Tudor, TAG Heuer, Raymond Weil, Breitling, Frederique Constant, Corum, Oris, Bulova Accu-Swiss, Longines, Porsche Design and U-Boat. The Rolex Oyster Perpetual Datejust Men’s Watch is an excellent choice for 2017. This exemplary crafted Swiss-made automatic watch is elegant, refined and the quintessential timepiece for men. The contoured signature round Oyster case in patented, polished Rolesor features a blend of 18K white gold and premium grade stainless steel. The Rolex Jubilee bracelet in satin-finished premium grade stainless steel adds to the classic contemporary design. The signature fluted bezel in polished 18K white gold surrounds the handsome sunray blue dial with polished silver-tone sword hands, a magnified date window at the 3 o’clock hour and silver-tone Roman numeral hour markers. Features include a locking screw-down crown and case back for water-resistance to 100 meters or 330 feet, along with a scratch resistant sapphire crystal above the dial. The Rolex Oyster Perpetual Datejust Men’s automatic watch is 36mm in diameter, 12mm thick and has been awarded Official Chronometer certification from the COSC (Official Swiss Chronometer Test Institute). 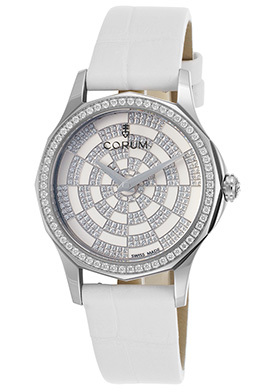 The Corum Admiral’s Cup Legend Diamond Women’s Watch is a celebrated choice for the New Year. Glowing with brilliance and luster, this breathtaking women’s dress watch features 308 dazzling diamonds pave-set to glowing perfection on the dodecagonal shaped bezel and patterned white dial with polished silver-tone sword hands. The dodecagonal shaped case in premium grade stainless steel is highly polished to a mirror-bright glow. The sumptuous white alligator strap adds to the stylish good looks. Premium Swiss-made quartz movement inside assures you of precise time-keeping accuracy. Features include a scratch resistant sapphire crystal above the dial and water-resistance to 50 meters or 165 feet. The Corum Admiral’s Cup Legend Diamond women’s watch is 32mm in diameter and 8mm thick. 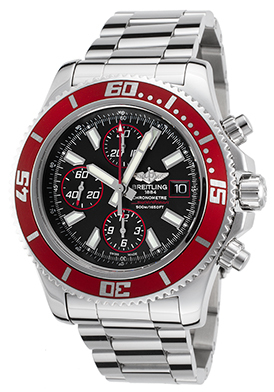 The Breitling Chronomat 41 Chronograph is another excellent selection to kick-off 2017 with. This Swiss-made automatic men’s watch in 18K rose gold and premium grade stainless steel has been awarded official Chronometer certification by COSC. The contoured round case in premium grade stainless steel is highly polished to a mirror bright finish and is presented on a handsome crocodile-textured black leather strap with contrasting white stitched detail. The polished 18K rose gold crown and push-pieces add striking contrast on the case side. The 18K rose gold unidirectional rotating bezel with engraved markers surrounds the black dial with a tachymeter outer dial, three gold colored sub-dials, luminous hands and hour markers. Features include an automatic date window, small-second, 30-minute and 12-hour registers. Additional features include a scratch resistant sapphire crystal above the dial, along with a locking screw-down crown and case back for water-resistance to 300 meters or 1,000 feet. 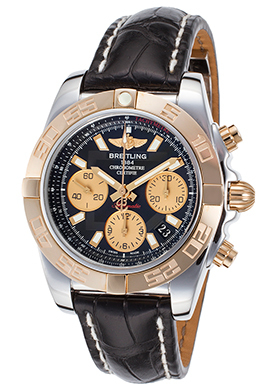 The Breitling Chronomat 41 men’s chronograph is 41mm in diameter and 16mm thick. The Longines Evidenza Diamond Watch for women is another splendid selection for 2017. 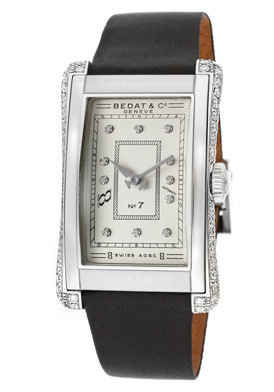 This timeless traditional women’s watch glistens with glamour in sparkling diamonds and lustrous stainless steel. The graceful Tonneau shaped case in premium grade stainless steel is highly polished to a mirror-bright patina. The supple black patent leather strap adds to the classically elegant good looks. Dazzling round-cut diamonds dramatically adorn the exterior sides of the polished stainless steel bezel and lugs. The dramatic black dial shines with polished silver-tone sword hands and diamond inlaid Arabic numeral hour markers. Features include premium Swiss-made quartz movement inside, a scratch resistant sapphire crystal above the dial and water-resistance to 30 meters or 100 feet. 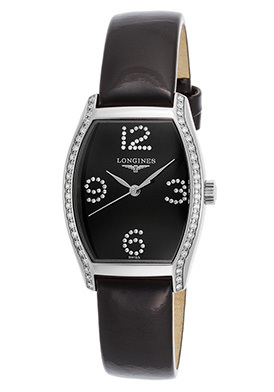 The Longines Evidenza Diamond Watch for women is 26mm wide and 8mm thick. The Porsche Design Titan Chronograph is a sleek, sporty and lightweight choice for the New Year. This precision crafted Swiss-made automatic men’s watch features the contoured round case and matching horizontal link bracelet in ultra-light, ultra-durable titanium with a satiny brushed finish. The bidirectional rotating tachymeter bezel in titanium with engraved markers surrounds the black dial with three sub-dials, luminous sword hands and luminous hour markers. Features include an automatic day and date window, small-second, 30-minute and 12-hour countdown timers. Additional features include a scratch resistant sapphire crystal above the dial and water-resistance to 120 meters. 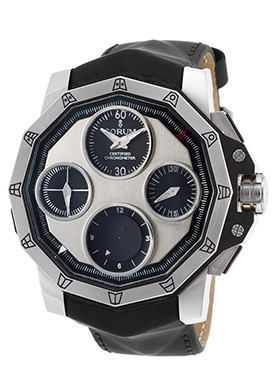 The Porsche Design Titan men’s chronograph is 41mm in diameter and 16mm thick. 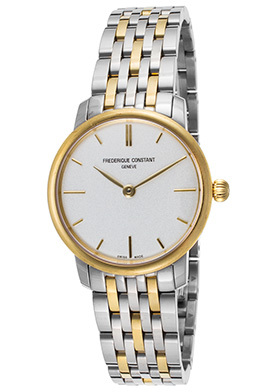 The Frederique Constant Slimline watch is a fashionable women’s selection for 2017. This Swiss-made wristwatch is exceptionally lightweight on the wrist with an ultra-slim, polished steel case that measures 29mm in diameter and 6mm thick. The two-tone vertical link bracelet in stainless steel and yellow gold-tone stainless steel is highly polished to a lustrous glow and has a push-button deployment clasp for added convenience and security. Decorative fluted detail accents the onion-shaped crown in polished yellow gold-tone stainless steel. The polished yellow gold bezel surrounds the white dial with yellow gold-tone baton hands and hour markers. Features include premium Swiss-made quartz movement inside, a scratch resistant sapphire crystal above the dial and water-resistance to 30 meters or 100 feet. Times Square New Year’s image courtesy of Wiki Commons. Italy is always a popular vacation destination during the Christmas holiday season. 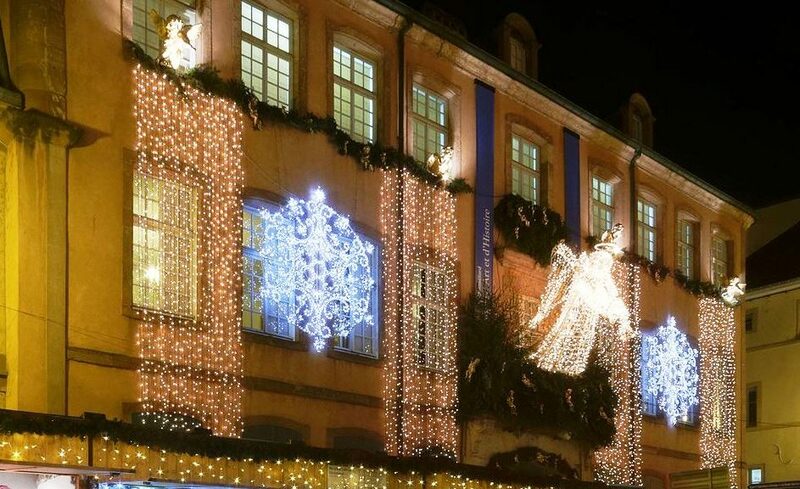 There’s something magical about both the city of Rome and the Vatican City, which are filled with breathtaking holiday decorations and awe-inspired festivities. The crisp winter weather and Old World opulence of Venice make it the perfect festive location to celebrate the holidays. The Italian Alps along with the Paganella and Cervinia Valtournenche resorts are popular holiday destinations for skiers and winter sports aficionados alike. 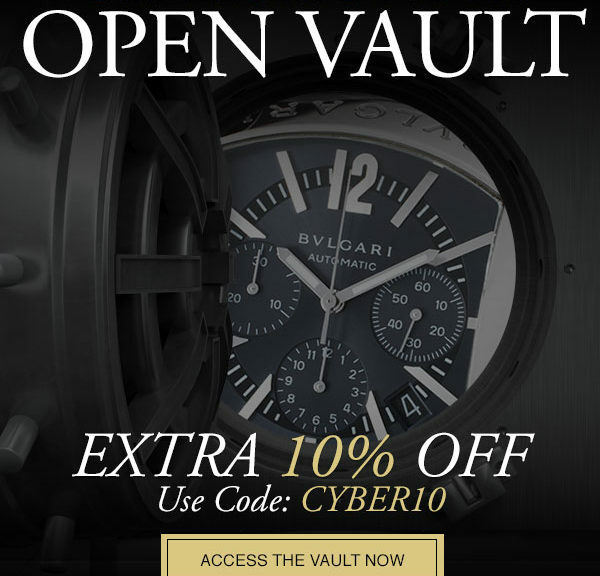 Whether your holiday plans are taking you to Italy this Yuletide season or other destinations near and far, you can certainly capture the spirit of Italy with the unsurpassed excellence of precision-made Italian timepieces from legendary watchmakers Bvlgari, Salvatore Ferragamo, U-Boat and Bruno Magli, which are all currently available at The Watchery. Bvlgari is prestigious Italian jeweler, renowned for its breathtaking jewelry and bespoke wristwatches. The Bvlgari Assioma Automatic Chronograph for men features the impeccable craftsmanship and design the brand is legendary for. The elongated rectangular-shaped case in premium grade stainless steel with a contoured top and bottom is highly polished to a mirror-bright patina. The black alligator leather strap adds to the striking design and has a convenient deployment clasp closure. The attractive charcoal gray dial features three sub-dials, luminous sword hands and baton hour markers. Features include an automatic calendar, small-second, 30-minute and 12-hour countdown timers. Features include premium Swiss-made automatic inside, a scratch resistant sapphire crystal above the dial, along with water resistance to 30 meters or 100 feet. 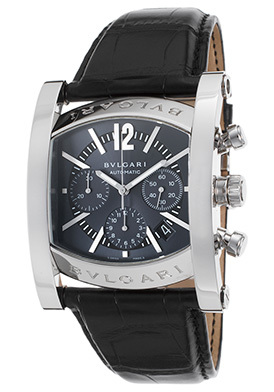 The Bvlgari Assioma Automatic Chronograph is 38mm wide and 13mm thick. 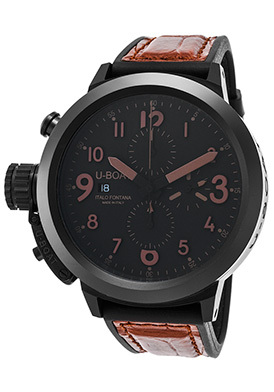 U-Boat is another highly esteemed Italian watch brand and the U-Boat Automatic Men’s Chronograph is pure energy on the wrist. 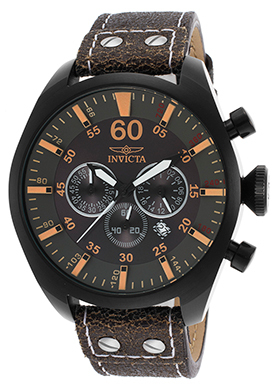 The dynamic Italian-made men’s watch features the ultra-bold, oversized case in durable high-tech black ceramic with a satiny brushed finish, presented on a handsome black rubber strap with genuine brown alligator inlays. The left-side facing crown with a protective cover and matching push-pieces add to the bold, modern design. The stationary, integrated bezel surrounds the sleek black dial with three sub-dials, matte brown sword hands and raised Arabic numeral hour markers. Features include a date window at the 9 o’clock hour, small-second, 30-minute and 12-hour countdown timers. An exhibition skeleton case back lets you see the intricate Automatic movement inside. Features include a scratch resistant sapphire crystal above the dial, a 44-hour power reserve and water-resistance to 100 meters or 330 feet. 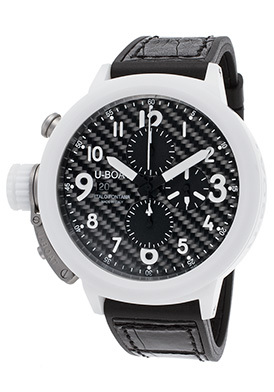 The U-Boat Automatic Men’s Chronograph is 50mm in diameter and 18mm thick. Salvatore Ferragamo is a brand synonymous with high-end Italian luxury, since it was founded in 1920’s as a bespoke shoe and leather goods maker. 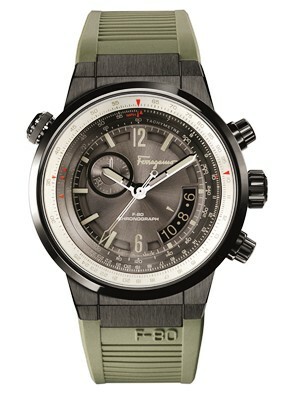 The Salvatore Ferragamo F-80 Men’s Watch makes an impression on the wrist with a black ion-plated stainless steel case in a satiny textured finish, presented on the high-performance green rubber strap with decorative horizontal fluted detail. A locking crown at the ten o’clock hour operates the inner rotating slide rule bezel. The charcoal gray dial has a tachymeter outer dial, a 30-minute sub-dial, an automatic date calendar, luminous green hands, luminous baton and Arabic numeral hour markers. Premium Swiss-made quartz movement inside assures you of precise time-keeping accuracy. Features include a scratch resistant sapphire crystal above the dial and water-resistance to 100 meters or 330 feet. 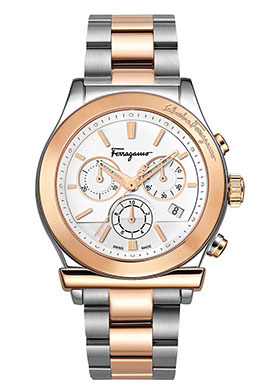 The Salvatore Ferragamo F-80 Men’s Watch is 43.5mm in diameter and 13mm thick. Bruno Magli is another prestigious Italian brand, popular first for its premium shoes and accessories. Magli expanded its product line in the early 2000’s and their wristwatches live up to the brand’s high standards and exemplary craftsmanship. The Bruno Magli Limited-Edition Ottanta men’s watch features classic traditional styling right for today and always. The round contoured case in 18K rose gold-plated stainless steel features a satiny brushed finish. The handsome alligator-textured Bordeaux colored leather strap adds to timeless design and has a convenient deployment clasp closure. Decorative raised beaded detail on the bezel adds distinction. 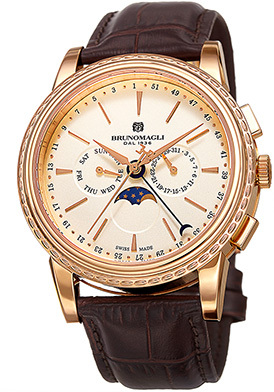 The cream colored dial features a date, day-of-the-week and moon-phase sub-dials, along with a week of the year outer dial, polished rose gold-tone sword hands and rose gold-tone baton hour markers. Premium Swiss-made quartz movement inside assures you of precise time-keeping accuracy. Features include a scratch resistant sapphire crystal above the dial and water-resistance to 50 meters or 165 feet. The Bruno Magli Limited Edition Ottanta men’s watch is 42mm in diameter and 12mm thick. 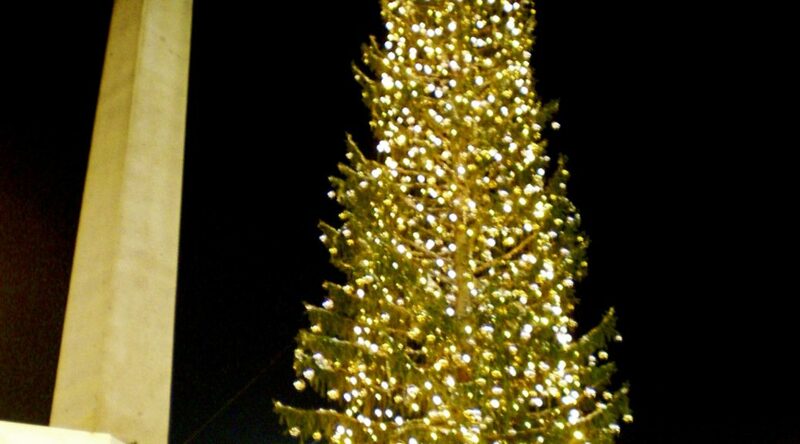 Christmas tree image courtesy of Wiki Commons. If you’re still trying to find the perfect gifts for everyone on your list this season, you should check out The Holiday Gift Guide at The Watchery. We have taken the guesswork out of finding just the right gift with special curated selections of men’s and women’s watches priced Up to $99.99, from $100 to $499.99 and from $500 and Up! Over 1450 of today’s most-wanted watches are featured in the promotion, including styles from Cartier, Rolex, Breitling, Bedat & Co., Porsche Design, TAG Heuer, Eterna, Corum, Bulova Accu-Swiss, Maurice Lacroix, Oris, Tissot, Longines, Gucci, U-Boat, Rado, Ebel, Luminox, Invicta, Michael Kors, TechnoMarine, Raymond Weil, Swiss Legend, Movado, Victorinox Swiss Army, Lucien Piccard, Daniel Wellington, Glycine and Elini Barokas. What’s more The Watchery is offering Free 2nd Day Business Shipping on purchases of $99 or more to ensure prompt holiday delivery. 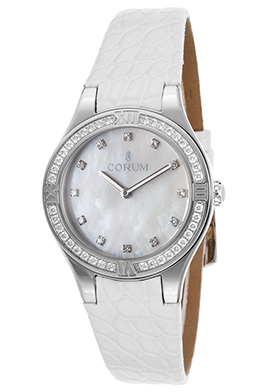 The Corum Romvlvs Diamond Watch for women is a stunning gift selection. This impeccably crafted timepiece sparkles with understated glamour in diamonds, 18K white gold and genuine alligator. The contoured round case in 18K white gold is highly polished to a mirror-bright patina. The iridescent Mother-of-Pearl shines with polished white gold-tone sword hands and twelve dazzling inlaid diamond hour markers. Premium Swiss-made quartz movement inside assures you of precise time-keeping accuracy. Features include a scratch resistant sapphire crystal above the dial and water-resistance to 30 meters or 100 feet. The Corum Romvlvs Diamond women’s watch is 31mm in diameter and 8mm thick. 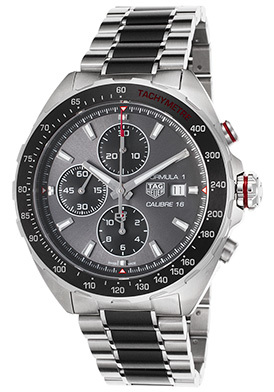 The TAG Heuer Formula 1 Automatic Chronograph is an excellent gift choice for men. 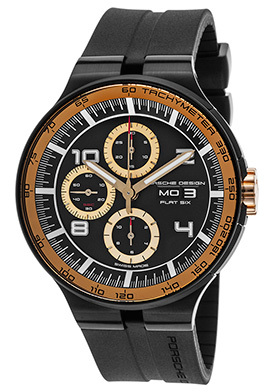 This high-performance Swiss-made men’s racing inspired wristwatch is certain to put your wrist in the fast lane with a contoured round case in brushed and polished premium grade stainless steel, presented on a brushed stainless steel multi-link bracelet with black ceramic center links. 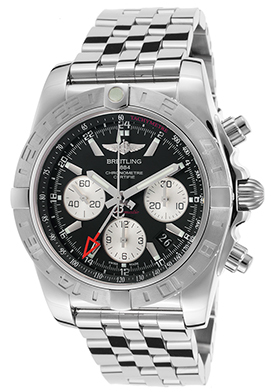 The stationary stainless steel bezel with a u-notch detailed rim has a screened black tachymeter ceramic top ring. The sunray gunmetal colored dial has small-second, 30-minute and 12-hour sub-dials, a window at the 3 o’clock hour, luminous silver colored hands and hour markers. Features include a glare-proof, scratch resistant sapphire crystal above the dial, a 42-hour power reserve, along with a locking screw-down crown and case back for water-resistance to 200 meters or 660 feet. The TAG Heuer Formula 1 Automatic men’s chronograph is 44mm in diameter and 11mm thick. 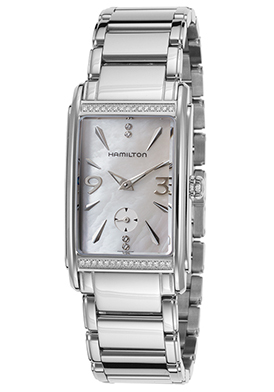 The Hamilton Ardmore Diamond watch is a splendid selection for women under $500. This lustrous Swiss-made women’s watch strikes a sophisticated note in shimmering diamonds and premium grade stainless steel. The elongated rectangular shaped case and matching link bracelet in stainless steel are highly polished to a lustrous glow. Thirty-four round-cut top Wesselton diamonds are pave-set to glowing perfection on the top and bottom portion of the polished stainless steel bezel. The iridescent Mother-of-Pearl dial shines with a small-second sub-dial above the 6 o’clock window, silver-colored sword hands, four inlaid diamond and raised polished silver-tone hour markers. Features include a scratch resistant sapphire crystal above the dial, premium Swiss-made quartz movement inside for precise time-keeping accuracy and water-resistance to 30 meters or 100 feet. The Hamilton Ardmore Diamond women’s watch is 24mm wide and 8mm thick. 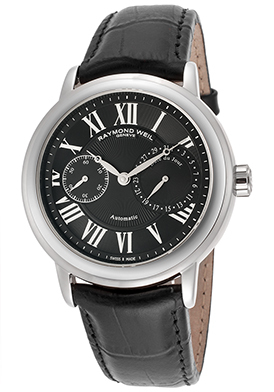 The Raymond Weil Tradition Watch is a worthy gift selection for men priced under $500. This timeless traditional Swiss-made men’s watch is elegant and urbane with a contoured round case in polished premium grade stainless steel, presented on a handsome black alligator-textured leather strap. The stationary perfectly round stainless steel bezel surrounds the legible black dial with a date window at the 12 o’clock hour, white sword hands, Roman numeral and baton hour markers. Premium Swiss-made quartz movement inside assures you or precise time-keeping accuracy. Features include a scratch resistant sapphire crystal above the dial and water-resistance to 50 meters or 165 feet. 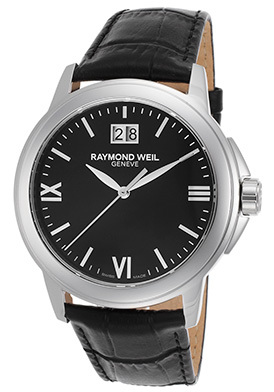 The Raymond Weil Tradition Watch is 42mm in diameter and 11mm thick. 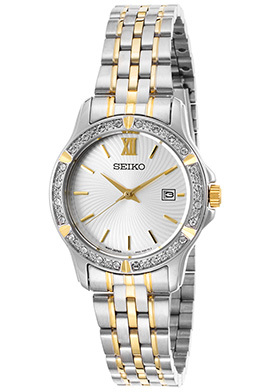 The Seiko Classic women’s watch in two-tone stainless steel is a shining holiday gift choice priced under $100. This classically elegant women’s watch features the graceful round case in polished stainless steel, presented on a multi-link bracelet in polished stainless steel with yellow-gold tone stainless steel accents. Glistening round-cut crystals adorn the lustrous stainless steel bezel with yellow gold-tone accents. The patterned, tone-on-tone silver colored dial shines with yellow gold-tone sword hands and baton hour markers. A window at the 3 o’clock hour reveals the automatic date calendar. Features include quality quartz movement inside, a Hardlex crystal above the dial and water-resistance to 30 meters or 100 feet. The Seiko Classic women’s watch is 28mm in diameter and 7mm thick. You don’t have to look any further than the Daniel Wellington Classic Canterbury timepiece for a stylish and appealing men’s watch priced under $100. The streamlined contemporary lines are modern, appealing and just right for today’s man. 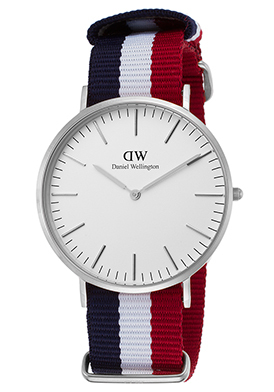 The ultra-slim, perfectly round case in polished stainless steel is presented on an attractive NATO striped nylon canvas strap in red, white and blue. 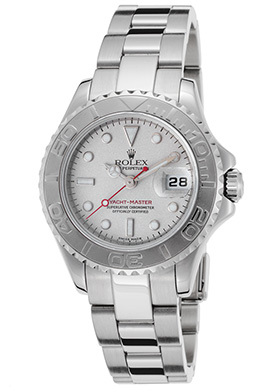 The attractive white dial shines with silver-tone baton hands and hour markers. Features include quality quartz movement inside for precise time-keeping accuracy and water-resistance to 30 meters or 100 feet. The Daniel Wellington Classic Canterbury men’s watch is 41mm in diameter and 6mm thick. 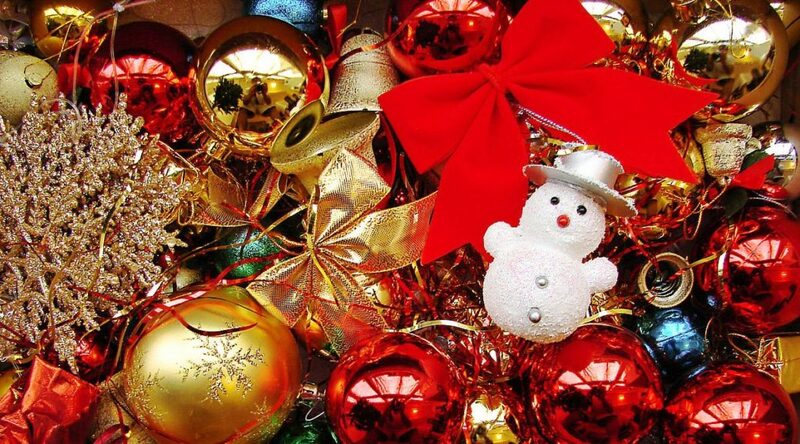 Holiday Image courtesy of Wiki Commons. There’s nothing like the joy of the holidays and celebrating with loved ones and close friends, many of whom you’ll be exchanging special gifts with this year as well. It’s also especially gratifying when you give someone special an unforgettable holiday gift they will treasure for years to come. Luxury high-end watches are on many individuals’ wish lists this year and we at The Watchery have curated a selection of exceptional luxury timepieces to consider for the special man or woman in your life. With both Christmas and Hanukah taking place on December 25th this year there’s in a little than two weeks, there’s no better time than right now to select a special holiday gift certain to make their eyes become all a glow. Rolex is one of the most sought-after watch brands in the world today and the Rolex Oyster Perpetual Datejust Men’s timepiece is a superlative selection. This exemplary crafted Swiss-made automatic watch is in a league of its own and holds the distinction of being awarded official Chronometer certification by the COSC (Official Swiss Chronometer Test Institute). The signature Tonneau shaped case in polished premium grade stainless steel is presented on the Rolex Jubilee bracelet in brushed stainless steel with polished 18K yellow gold center links. The signature raised fluted bezel in polished 18K yellow gold surrounds champagne yellow gold-colored metallic dial with polished yellow gold-tone baton hands and raised Roman numeral hour markers. A magnified Cyclops window at the 3 o’clock hour reveals the automatic date calendar. Features include a glare-proof scratch resistant sapphire crystal above the dial, along with a screw-down crown and case back for water-resistance to 100 meters or 330 feet. 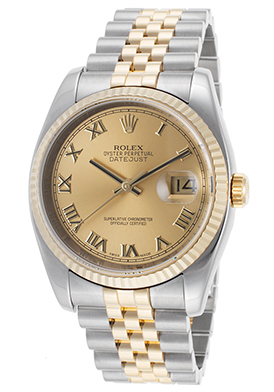 The Rolex Oyster Perpetual Datejust Men’s watch is 36mm wide and 12mm thick. Diamond watches are a popular holiday favorite for women and the Chopard Happy Sport Diamond Watch in 18K rose gold is a spectacular gift selection. Beset with brilliance and glamour, this exquisite Swiss-made women’s watch is crafted to perfection with a contoured round case and matching vertical link bracelet in 18K rose gold, highly polished to a mirror-bright patina. The integrated stationary 18K rose gold bezel surrounds the iridescent Mother-of-Pearl with five floating, shimmering bezel-set diamonds with rose gold-tone hands, Roman numeral and baton hour markers. Features include premium Swiss-made quartz movement inside, a scratch resistant sapphire crystal above the dial and water-resistance to 30 meters or 100 feet. 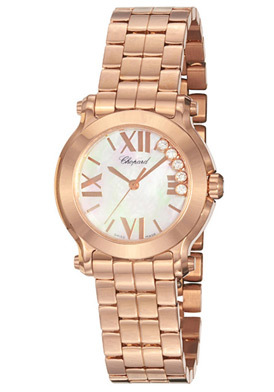 The Chopard Happy Sport Diamond women’s watch is 30mm in diameter and 10mm thick. 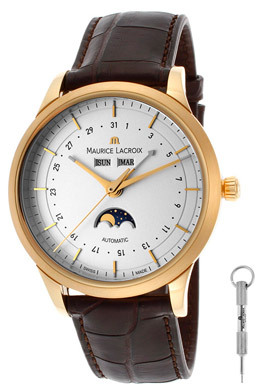 Maurice Lacroix Les Classiques Automatic Watch is another outstanding gift selection for men. This timeless traditional Swiss-made men’s watch is impeccably crafted with a round contoured case in 18K yellow gold with a satiny brushed finish. 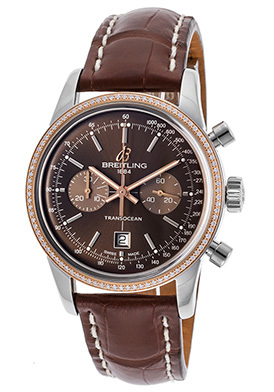 The handsome alligator-textured brown leather strap adds to the classically elegant design. The striking silver-colored dial features yellow gold-tone baton hands and hour markers, day and month windows, a date calendar center dial with an independent silver-tone hand and a moon-phase sub-dial. An exhibition skeleton case back lets you see the intricate automatic movement inside. Features include a scratch resistant sapphire crystal above the dial, a sapphire crystal above the dial, water-resistance to 30 meters or 100 feet and a push-button recessed crown tool. 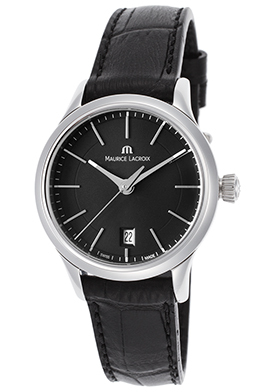 The Maurice Lacroix Les Classiques Automatic men’s watch is 40mm in diameter and 12mm thick. 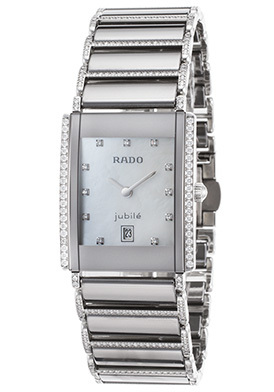 The Rado Integral Diamond Watch for women is pure enchantment. This breathtaking Swiss-made women’s watch glistens with glamour in dazzling diamonds, stainless steel and silver colored ceramic. The rectangular shaped case in lustrous stainless steel is presented on the gleaming horizontal link bracelet in stainless steel and lustrous high-tech silver colored ceramic. Shimmering round-cut diamonds, pave-set to perfection are presented to the exterior sides of the bezel and bracelet links. The iridescent Mother-of-Pearl dial shines with silver colored baton hands and eleven diamond hour markers. A window at the 6 o’clock hour reveals the automatic date calendar. Features include premium Swiss-made quartz movement inside, a scratch resistant sapphire crystal above the dial and water-resistance to 30 meters or 100 feet. The Rado Integral Diamond women’s watch is 24mm wide and 6mm thick. 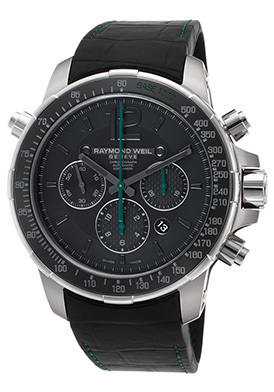 The Raymond Weil Nabucco Automatic Chronograph is another excellent timepiece for men. The ultra-light, ultra-durable case in brushed titanium is exceptionally comfortable on the wrist and is presented on a crocodile textured black rubber strap with a convenient push-button deployment clasp. The black ceramic tachymeter bezel with screened markers surrounds the black dial with three sub-dials, an automatic date calendar, luminous hands and hour markers. Features include small-second, 30-minute and 12-hour countdown timers. An exhibition skeleton case back lets you see the intricate Swiss-made automatic movement inside. Additional features include a 46-hour power reserve, a scratch resistant sapphire crystal above the dial and water resistance to 200 meters or 660 feet. 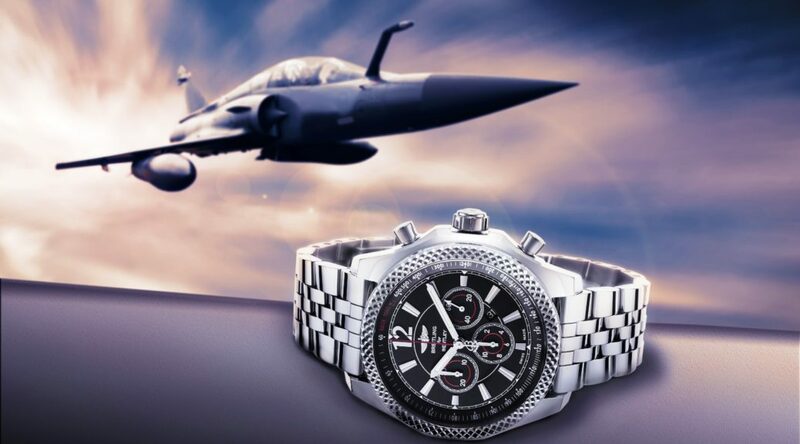 The Raymond Weil Nabucco Automatic Chronograph is 46mm in diameter and 16mm thick. The Eterna Grace Diamond Automatic watch is another stellar gift selection for women. This exquisitely crafted women’s dress watch a stunning array of brilliant round-cut diamonds, pave-set to glowing perfection on the bezel and outer bezel rim. The contoured round case and matching H-link bracelet in premium grade stainless steel are highly-polished to a mirror-bright glow. The captivating black Mother-of-Pearl dial shines with crescent shaped clusters of diamonds on the background, an open heart window and polished silver-tone hands. Features include an exhibition skeleton case back, water-resistance to 50 meters or 165 feet and a scratch resistant sapphire crystal above the dial. 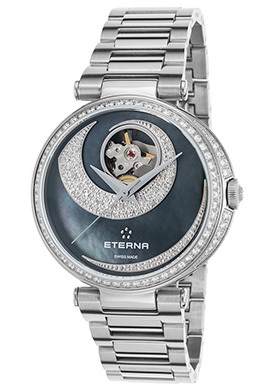 The Eterna Grace Diamond Automatic women’s watch is 34mm in diameter and 10mm thick. Holiday scene image courtesy of Wiki Commons. The Season’s Brightest New Arrivals! Hundreds of extraordinary new arrivals from many of today’s most prestigious high-end watchmakers have recently arrived at The Watchery, just in time for the Christmas gift-giving season. The very latest styles from some of the best names in horology are featured in the event, including models from Oris, Frederique Constant, Porsche Design, Corum, Michael Kors, Eterna, Versace, Salvatore Ferragamo, Baume & Mercier, TechnoMarine, Diesel, S. Coifman, Invicta, Lancaster Italy, Seiko, Puma, Bulova and Skagen. 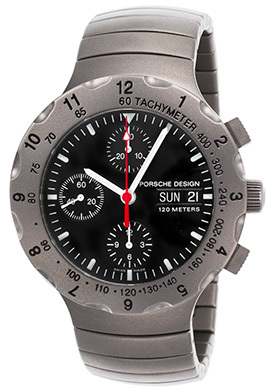 The Porsche Design Worldtimer GMT Automatic watch is an exemplary choice for the discerning man. This prestigious Swiss-made men’s automatic timepiece features the round contoured case in 18K rose gold in a satiny brushed finish. The high-performance black rubber strap adds to the modern, contemporary design and features a push-button deployment clasp for added convenience and security. Dual screw-down locking crowns on the case side feature raised textured detail for added distinction. The highly legible black dial features luminous rose gold-tone hands, Arabic numeral 12/24 hour markers and a GMT time-zone window between the 8 and 10 o’clock hours that work in harmony with the global location window at the 3 o’clock hour. 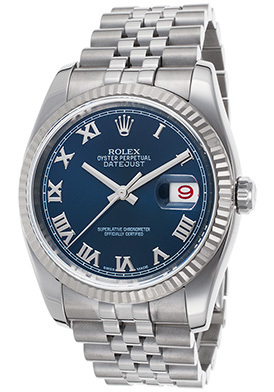 The engraved screw-down case back features the 24 different global cities featured on the dial and their abbreviations. Features include a scratch resistant sapphire crystal above the dial and water-resistance to 100 meters or 330 feet. 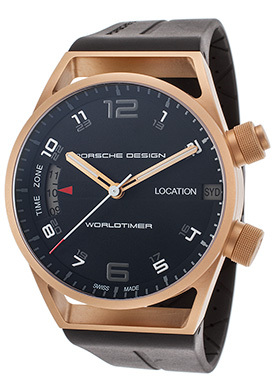 The Porsche Design Worldtimer GMT automatic men’s watch is 45mm in diameter and 17mm thick. 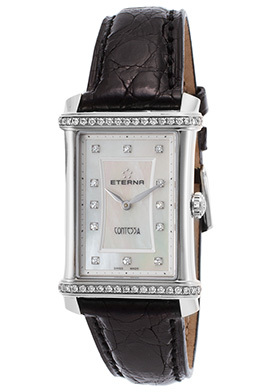 The Eterna Contessa Diamond watch is an extraordinary holiday gift choice for women. Glowing with brilliance and luster, this classically elegant Swiss-made women’s watch features the elongated rectangular shaped case with graceful contoured sides and a satiny brushed finish. The genuine, hand-crafted black alligator strap adds to the timeless design. Thirty-eight shimmering round-cut diamonds create a dramatic focal point on the top and bottom sides of lustrous stainless steel bezel. The iridescent Mother-of-Pearl dial shines with twelve brilliant inlaid hour markers. Features include a scratch resistant sapphire crystal above the dial, premium Swiss-made quartz movement inside for precise time-keeping accuracy and water-resistance to 50 meters or 165 feet. 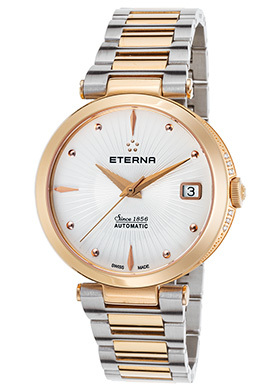 The Eterna Contessa Diamond women’s watch is 23mm wide and 7mm thick. 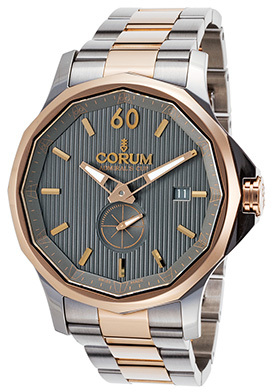 The Corum Admiral’s Cup Legend Automatic Watch for men is another excellent holiday gift selection. This outstanding Swiss-made men’s watch is meticulously crafted to the luxury of every detail. The signature twelve-side dodecagonal shaped case in premium grade stainless steel has an alternating brushed and polished finish. The matching triple-line bracelet with brushed premium grade stainless steel outer links and polished 18K rose gold center links has a convenient push-button clasp. The polished dodecagonal shaped 18K rose gold bezel surrounds the handsome dark gray dial with fluted detail, the Admiral’s Cup signature flag emblem outer dial, a small second sub-dial, luminous rose gold-tone outlined hands and raised rose gold-tone baton hour markers. A window at the 3 o’clock hour reveals the automatic date calendar. An exhibition skeleton case back lets you see the intricate Swiss-made automatic movement inside. Features include a scratch resistant sapphire crystal above the dial and water-resistance to 50 meters or 165 feet. The Corum Admiral’s Cup Legend Automatic men’s watch is 42mm in diameter and 10mm thick. 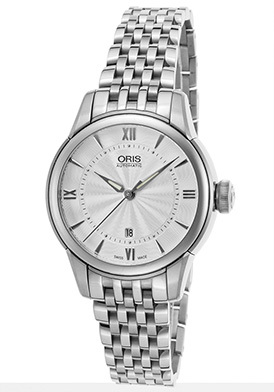 Understated elegance triumphs with the Oris Artelier Automatic Women’s watch. This timeless traditional Swiss-made women’s watch features the perfectly round case and matching multi-link bracelet in premium grade stainless steel with a contrasting brushed and polished finish. The perfectly round polished steel bezel surrounds the silver guilloche dial with polished silver-tone luminous sword hands, polished silver-tone hour markers and an automatic date window at the 6 o’clock hour. An exhibition skeleton case back lets you see the intricate Swiss-made automatic movement inside. Features include a scratch resistant sapphire crystal above the dial and water-resistance to 50 meters or 165 feet. The Oris Artelier Automatic Women’s watch is 31mm in diameter and 11mm thick. The U-Boat Flightdeck Automatic Chronograph offers a modern, innovative take on time for today’s man. The robust 50mm diameter, 18mm thick case in matte white high-tech ceramic is hypoallergenic and scratch-resistant. The left-facing crown and push-pieces with a protective cover on the case add to the bold, modernistic design. The handsome black alligator inlaid black rubber strap offers sleek and stylish contrast to the case. The integrated bezel surrounds the black carbon fiber dial with a date window, small-second, 30-minute and 12-hour sub-dials, luminous sword hands and luminous Arabic numeral hour markers. Features include a scratch resistant sapphire crystal above the dial, along with a screw-down crown and case back for water-resistance to 100 meters or 330 feet. Nothing says fashion-forward more than the Michael Kors wristwatch and the Michael Kors Whitley women’s watch is a splendid holiday gift choice. This breathtaking women’s watch features the trend-setting oval shaped case in yellow gold-tone stainless steel, highly polished to a lustrous patina. The light brown crocodile-textured leathers strap adds to the stylish good looks. Two rows of dazzling inlaid crystals weave intrigue on the oval shaped bezel in yellow gold-tone stainless steel. The dramatic, fan-patterned light gold colored dial shines with a day-of-the-week subdial, yellow gold-colored sword hands, raised yellow gold-colored Roman numeral hour markers. A window at 3 o’clock hour reveals the automatic date calendar. Features include quality quartz movement inside for precise time-keeping accuracy and water-resistance to 50 meters or 165 feet. 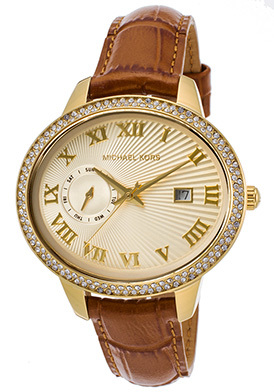 The Michael Kors Whitley women’s watch is 41mm in diameter and 11mm thick. Holiday light image courtesy of Wiki Commons. 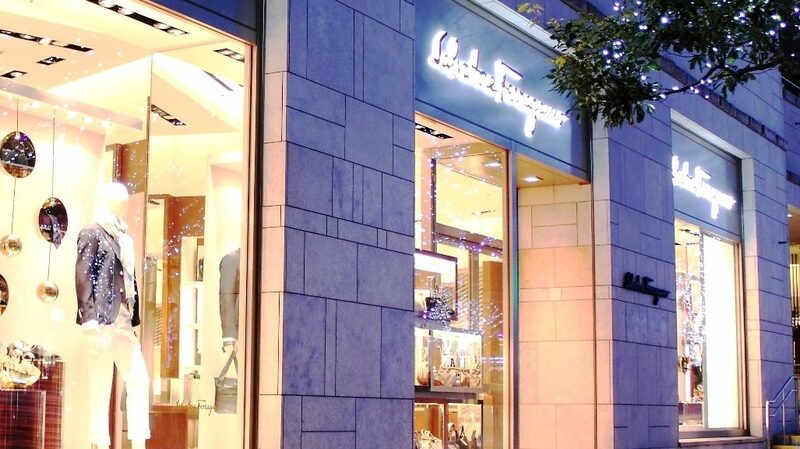 When it comes to high-end Italian luxury, Salvatore Ferragamo is one of the most respected and revered fashion brands in the world today, prominent and highly sought-after for its expertly crafted shoes, handbags, accessories and apparel. The brand originated in the 1920’s when Salvatore Ferragamo, a shoemaker emigrated from Italy to the United States and in 1923 opened a boot shop in Hollywood, CA, where he made shoes for legendary screen actresses Joan Crawford and Gloria Swanson, as well as for cast members of the film The Ten Commandments. Several years later, Ferragamo moved back to Italy and opened a shoe store in Florence in 1928. Ten years later Ferragamo took over the Palazzo Spini Feroni, one of the great palaces in Florence, which remains the brand’s flagship store today. In his early years, Ferragamo studied anatomy to make shoes more comfortable and he is responsible for the wedge heel, the shell shaped sole, along with metal heels and soles and the invisible sandal. Film stars and dignitaries such as Princess Diana, Andy Warhol, Sophia Loren, Audrey Hepburn, Margaret Thatcher and Greta Garbo are among the brand’s celebrated clients. The Salvatore Ferragamo brand today remains family owned and operated. After adding leather handbags and accessories to its assortment in its earlier years, Ferragamo more recently branched out into fashion apparel, fine fragrances, sunglasses and wristwatches. The brand’s timepieces feature the classic, refined Italian design the Salvatore Ferragamo brand is renowned for, matched to precision Swiss-made craftsmanship inside and out. 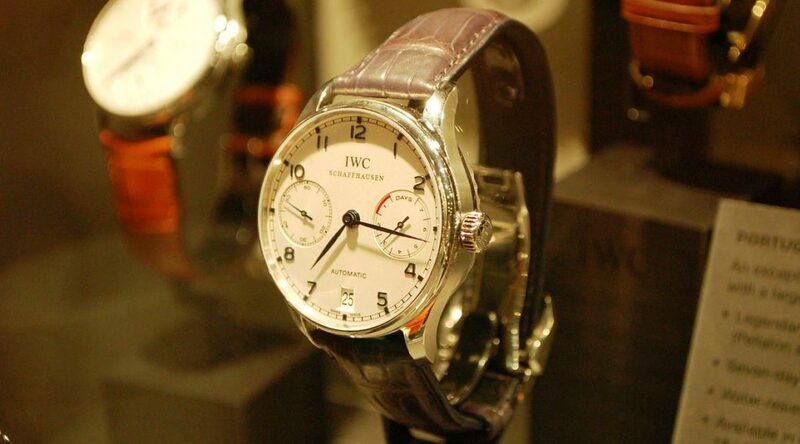 Many of the models feature the brand’s signature on the bezel along with its Gancini emblem on the cases and dials. You’ll find an impressive array of prestigious Ferragamo Watches for men and women at The Watchery, including popular styles from the F 80, Gancino, Salvatore, Lirica, Sparks and Vega collections. Ultra-sleek and sporty, the Ferragamo Salvatore Men’s Chronograph strikes a sophisticated,n urbane note in two-tone stainless steel. The modern, contemporary styling features the contoured round case in polished premium grade stainless steel, presented on a triple-link bracelet in brushed stainless steel with polished yellow gold-tone center links. The perfectly round, polished yellow gold-tone bezel and matching bar lug forming the Gancini emblem surrounds the white dial with three sub-dials, gold-tone skeleton hands and gold tone baton hour markers. Features include an automatic date window, 1/10th of second, small-second and 30-minute registers. Additional features include a scratch resistant sapphire crystal above the dial, premium Swiss-made quartz movement inside and water-resistance to 30 meters or 100 feet. The Ferragamo Salvatore Men’s Chronograph is 42mm in diameter and 12mm thick. The Ferragamo Lirica Women’s Watch adds a look of assured and confident elegance in lustrous gold-ton ion-plated stainless steel. The contoured round case and stationary bezel in polished yellow gold-tone stainless steel capture the essence of the Gancini emblem. The black cabochon-cut stone on the fluted gold-tone crown adds distinction. 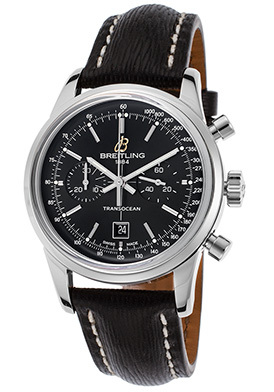 The attractive black leather strap with matelassé details adds to the exceptional good looks. The black Mother-of-Pearl dial shines with fifty-seven shimmering inlaid diamonds that form the Gancini emblem on the background, polished gold-tone sword hands and baton hour markers. Features include premium Swiss-made quartz movement inside, a scratch-resistant sapphire crystal above the dial and water-resistance to 50 meters or 165 feet. The Ferragamo Lirica Women’s Watch is 33mm in diameter and 8mm thick. Ultra-bold and masculine, the Ferragamo F 80 Chronograph for men features a dynamic and innovative blend of titanium and black ceramic. The contoured round case in ultra-light, ultra-durable brushed titanium is presented on a handsome vertical link bracelet in brushed titanium with lustrous black ceramic accents. The lustrous black ceramic tachymeter bezel with screened markers surrounds the patterned black dial with three sub-dials, an automatic date window, luminous hands and luminous hour markers. Features include 1/0th of a second, small-second and 30-minute countdown timers. Additional features include premium Swiss-made quartz movement inside, an anti-reflective sapphire crystal above the dial and water-resistance to 100 meters or 330 feet. 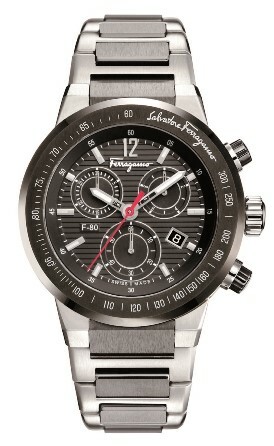 The Ferragamo F 80 men’s chronograph is 44mm in diameter and 12.5mm thick. The Ferragamo Gancino Soiree women’s watch offers exquisite contours in lustrous yellow gold-tone stainless steel and red patent leather. The perfectly round case and bar shaped lugs in yellow gold-tone stainless steel form the emblematic Gancini emblem. The lustrous patterned red patent leather strap adds to the chic and stylish good looks. The iridescent Mother-of-Pearl dial shines with gold-tone baton hands and sparkling inlaid diamond hour markers. Features include premium Swiss-made quartz movement inside for precise time-keeping accuracy, an anti-reflective scratch resistant sapphire crystal above the dial and water-resistance to 30 meters or 100 feet. 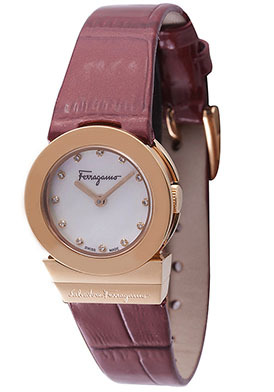 The Ferragamo Gancino Soiree women’s watch is 24mm in diameter and 8mm thick. Salvatore Ferragamo store image courtesy of Wiki Commons.